On Wall Street, they may be popping the champagne bottles over big bank profits this past quarter. But times are tough for small to mid-size banks around the country as failures mount higher and higher. The top 10 bailed-out banks -- Citigroup, Bank of America, JPMorgan Chase, Wells Fargo, Goldman Sachs, Morgan Stanley, PNC Financial, U.S. Bancorp, SunTrust and Capital One - have reported combined profits this year of $13.5 billion in the first quarter, $16.8 billion in the second quarter and $11 billion in the third quarter after a massive $18 billion loss in the fourth quarter of 2008. Meanwhile, the number of failed banks has quintupled, from 10 in the third quarter of 2008 to 50 in the third quarter of 2009. So far this year, 106 banks with assets totaling $106 billion have failed, almost half of which have been concentrated in three states (California, Georgia and Illinois). That has put a major dent in the Federal Deposit Insurance Corporation's fund that insures deposits which recently fell into the red. Burdened by worsening commercial real estate loans, many small banks' troubles are just beginning. Many analysts say that the now-toxic loans could sink hundreds of small lenders over the next few years and place a significant drag on the economy. Some economists have questioned what seems to be a two-tier system. "There is no good case for making the smaller, competitive, community-oriented institutions take the brunt of the down-sizing, as opposed to the bloated, ungovernable, and predatory institutions that were at the center of the crisis," Nobel-Prize-winning economist Joseph Stiglitz told a Senate committee back in April. "A predicted result of a formal TBTF policy is that the gap between the interest rate that smaller banks must pay to obtain deposits and otherwise borrow funds and the interest rate paid by the TBTF banks would increase, since the TBTF banks are now effectively able to borrow all their funds (not just smaller deposits) with the backing of the federal government." And banking officials in states hit by bank failures have also been outspoken in their criticism of the administration's policy. "Federal policy has not treated the rest of the industry with the same expediency, creativity or fundamental fairness," Joseph A. Smith Jr., the North Carolina commissioner of banks, testified in Congress earlier this month. "This has been a lost opportunity for the federal government to support community and regional banks and provide economic stimulus." The message seems to be sinking in with the Obama administration, which is set to revise its policy on such banking behemoths this week. 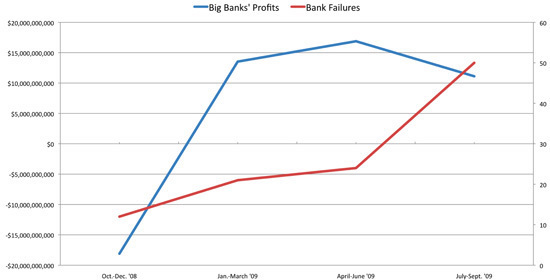 "'Too big to fail' has become worse," FDIC chair Sheila Bair told USA TODAY last week. "It's become explicit when it was implicit before. It creates competitive disparities between large and small institutions, because everybody knows small institutions can fail. So it's more expensive for them to raise capital and secure funding." President Obama himself acknowledged the perception of such a disparity in a July speech though he defended the administration's approach during the financial crisis: "I know that many community bankers consider it unfair that small banks--which did not cause the financial mess--are allowed to fail, while larger banks that took the biggest risks are rescued. That's an understandable reaction. But we can't escape the reality that certain institutions, by virtue of their size or their linkages to key markets, pose unique risks to the system and can bring others down with them." Instead, those companies would be allowed to borrow money from the government. The government would then recoup the costs by either seizing the firm's profits or seeking restitution from the entire industry, the aide said.